Ozeri Digital Bathroom Scale Review | Be Plum Crazy! 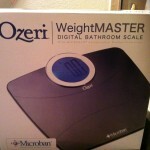 Plum Crazy About Coupons has had the opportunity to review an Ozeri Digital Bathroom Scale. With my continuous weight loss effort I really needed a new bathroom scale. Mine was 10 years old and not very accurate. Plus it didn’t have ounces only the main number. Seeing that today is Saturday and it is my weigh in day, I decided that it would be a good day to try out my new scale. My Dr. has recently put me back on a high dose of my steroid medication so that is usually not good. Last week I gained a couple pounds and it seems that this week I gained a couple also. But a couple things to remember. It’s a new scale ( I know, it’s just another excuse). But as you can see compared to my old one there is a few lbs. difference. So, I don’t know whether to say I gained those pounds or what. I guess we will just have to take the new weight on the new scale and keep on going with that weight. So it brings my total to, if you go by the old scale it stayed the same at 240 for a total of 44 lbs. down. If you go by the new scale which we will be going by from now on it’s 242.8 for a total of 41.2 lbs down. I’m hoping that this next week brings some better news. The Ozeri WeightMaster uses 4 of the latest generation G sensors to accurately capture weights in increments of 0.2 pounds or 0.1 kilograms. 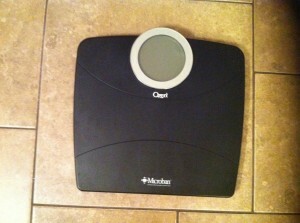 I received an Ozeri Weightmaster Digital Bathroom Scale with Microban. Ozeri is proud to be the first manufacturer of bathroom scales to champion Microban antimicrobial technology, inhibiting the growth of odor and stain causing bacteria. I couldn’t believe how thin it was. The scale measures 14 inches X 13 1/2 inches. It is also lightweight and weighs only 3 lbs. I love the big blue lit up screen except you can’t hide it if there is any one else around. It lights up nicely in the dark. You can find this item and more at the OzeriStore.com. Features the industry’s largest blue-backlit LCD with xBright technology for easy-to-read results from afar. Ultra sturdy scale combines ABS slip-resistant material on the outside with 6mm impact-resistant tempered glass on the inside. 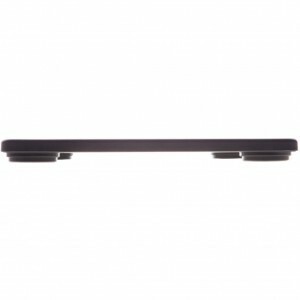 Step-on Activation captures the precise weight measurements upon stepping on the scale (no tapping required). Auto-calibrated and automatically turns off to conserve battery life. Runs on 3 AAA batteries with a Low Battery Indicator (batteries included). Infused at the point of manufacturing, Microban® antimicrobial protection works for the lifetime of the product to disrupt the growth of bacteria and helps maintain surface cleanliness. On an unprotected bathroom scale surface, bacteria can double in number every twenty minutes with frequent skin contact and exposure to moisture, which is often the case with typical bath scale usage. And only when they’ve multiplied to hundreds of thousands, can the bacteria be seen by the naked eye. With Ozeri WeightMaster Bath Scale, Microban® protection begins to work immediately, disrupting key bacterial cell functions so that the bacteria are unable to grow or reproduce on the surface. The WeightMaster Bath Scale by Ozeri is the first bathroom scale to combine an elegant design, Microban’s antimicrobial solution and advanced weight measurement technology.